Craigslist: You could make the argument that because of Craigslist’s simplistic design (or lack thereof), it’s more user friendly, but the overwhelming amount of information on each page makes it incredibly difficult to navigate the site unless you’ve done it before. OfferUp: There’s definitely a learning curve to navigating OfferUp, but the ability to contact sellers directly through the app makes this much easier than email workarounds that Craigslist offers. Did we mention that OfferUp has an app (unlike Craigslist) so you can find your dream couch while you’re on the bus home? Craigslist: Three words: Times. New. Roman. Craigslist’s homepage today looks (almost) exactly like it did in 1998 – and while everyone loves the ‘90s, there’s a reason the internet (and its design) moved forward. OfferUp: Nice shades of green, a Pinterest-like layout, and a minimalistic font. It’s a designer’s dream, especially when compared to the Craigslist design nightmare. Craigslist: Everyone knows and uses Craigslist, whether you’re in a big city like Boston or a small suburban town. In fact, it’s the 19th most popular website in the U.S. and in the top 100 sites in the world. If you list or buy on Craigslist, you’re far more likely to find someone who’s nearby who wants to work with you. OfferUp: While OfferUp is the largest mobile marketplace, it’s still miles behind Craigslist in its overall presence. While big, tech-friendly cities like Seattle and Boston have huge memberships on OfferUp, it’s still taking off in other cities and less urban areas. Craigslist: Buried at the bottom of each page are tiny links to their “help” database, which is chock-full of common questions. There are also lists of tips, tricks, and FAQs from power users to help you navigate while waiting back after submitting your online support form. 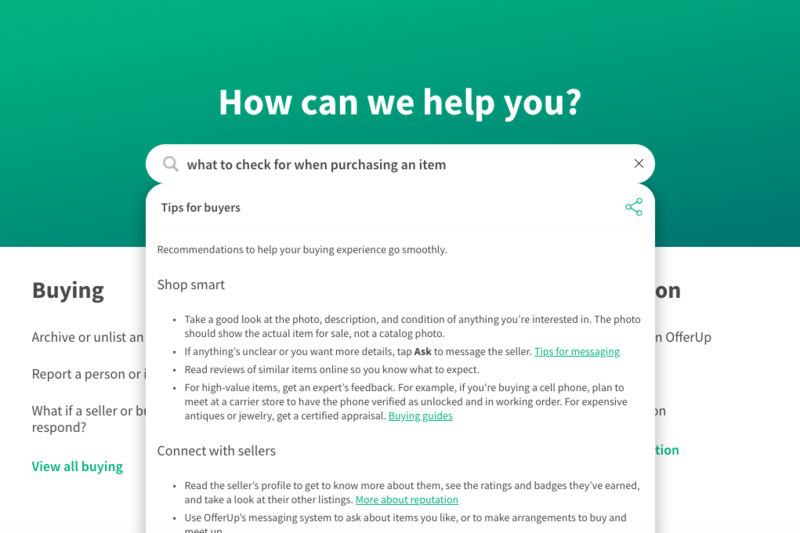 OfferUp: OfferUp also has a (slightly less buried) database of Q&A, and they also have a community platform to discuss buying and selling with power users. They also offer support via Twitter, but if you want to talk to a representative over the phone, you’ll have to submit an online form, too. Craigslist: Craigslist’s safety policy consists of a few web pages of basic advice: don’t go alone, meet in public, no wire transfers. If you’re looking for more in-depth information about how to sell safely on Craigslist, you’re best off looking elsewhere, like at our list of ways to avoid the most common Craigslist scams. 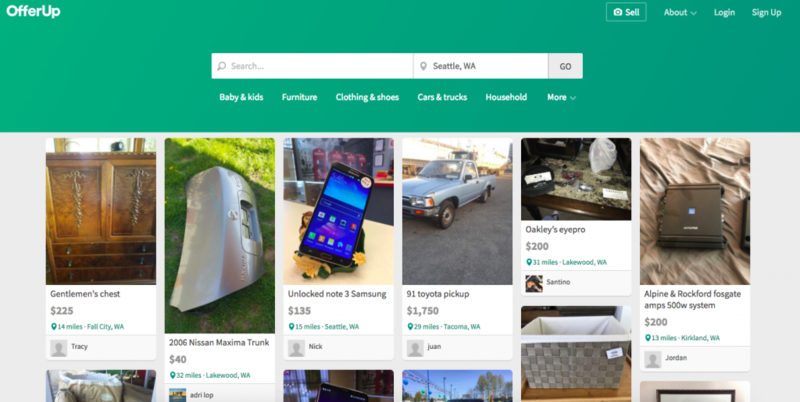 OfferUp: Recognizing how Craigslist left holes in safety for online marketplaces, OfferUp aims to fill the void by making online sales ultra-safe. There’s TruYou verification, where a user can have their identity verified with their driver’s license so you know they’re trustworthy, in-depth user profiles that include photos and contact info, messaging within the app to avoid your information being misused, and their Community MeetUp spots that provide you with a safe place to conduct your sale in-person. 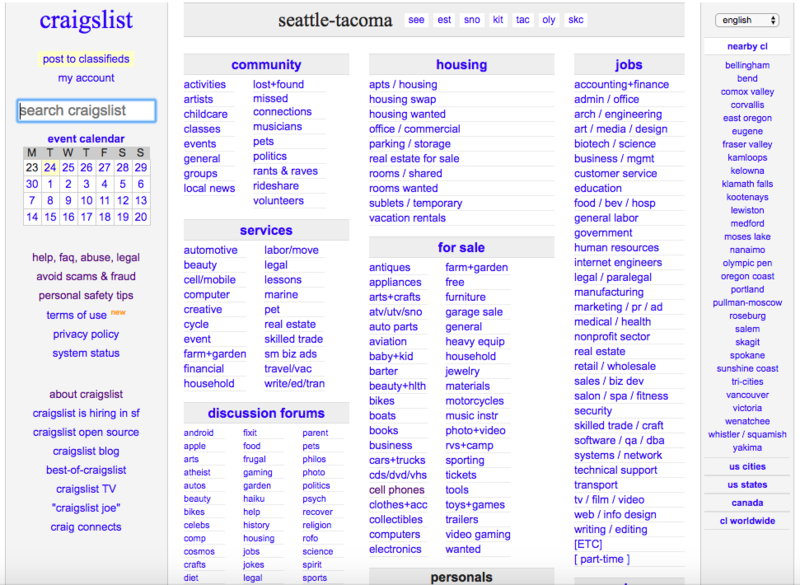 Craigslist: You can buy ads on Craigslist, but do you need to? Craigslist’s algorithm is optimized, just like Google’s. In other words, the same tactics you use to get a webpage to the top of a Google search – like including relevant terms – can be used to put your ad at the top regardless of when it was posted. OfferUp: Ads are key to getting your item sold on OfferUp, because the “feed” of available items is displayed chronologically (except for ads). Ads on OfferUp are termed “bumps” and start at $2 – fairly affordable to bump your item back up to the top, but it might not be an option if you are hoping to sell in order to make money, not lose it. Both OfferUp and Craigslist have plenty to offer as both a buyer and a seller, but have their own unique set of benefits. And if neither sounds like your perfect site, there are plenty of Craigslist alternatives out there like NextDoor, LetGo, Facebook Marketplace…the list goes on. One thing that is clear about both? Dolly can help you pick up or deliver your items no matter which site you choose! Make buying and selling easier by relying on Dolly to take care of your items. Our background-checked Helpers will bring their pickup truck to the seller’s house to pick up your new-to-you couch, elliptical trainer, grill, or furniture you find on Craigslist or OfferUp. Get your OfferUp delivery or Craigslist delivery done by Dolly.